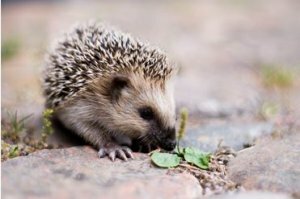 A Community Calendar to publicise your local events. Please add your event and we will update the Calendar. Are you aged between 2 and 11 years old? Bring your family (and wellies) and join us in our lovely grounds for our annual Easter Egg Hunt and refreshments. Complete the course to receive an Easter egg and certificate. Well behaved dogs on leads are welcome to join in the fun! 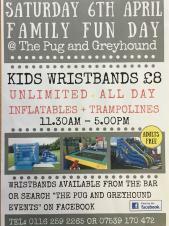 Wristbands available for unlimited inflatables and trampolines. 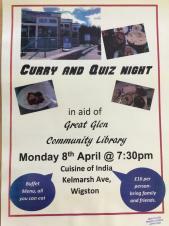 Curry & Quiz night in aid of Great Glen Community Library. All you can eat buffet, £16 per person. New and Old Members welcome. 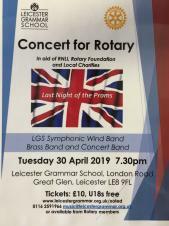 LGS Symphonic Wind Band, Brass Band and Concert Band.